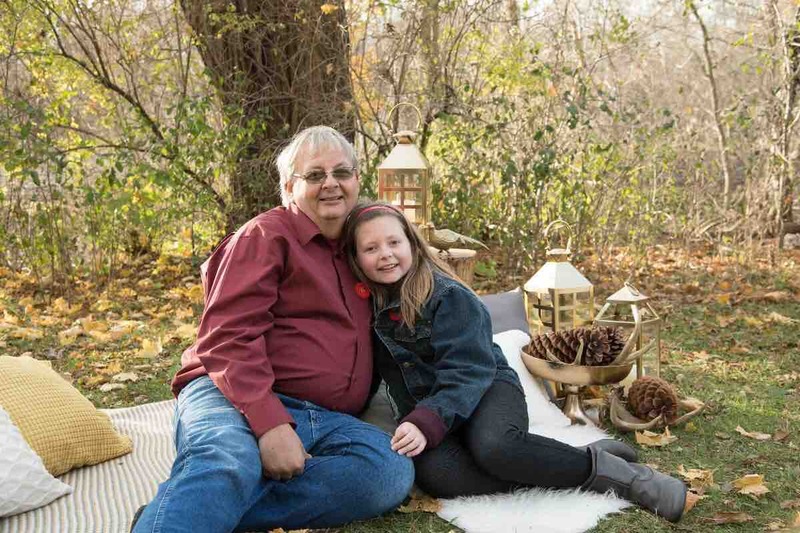 After 2 years of significant illnes, my brother Bruce was diagnosed in 2017 with Stage 4 Non-Alcoholic Cirrhosis of the Liver and is in need of a liver transplant to survive. Unfortunately, Cirrhosis is considered a "drinking" disease when, in fact, my brother has never been a drinker. He is a sole support father of an 11 year old daughter who is his world. Bruce wants to survive to see his daughter grow up and there are many challenges ahead. The expenses related to a transplant far exceeds what OHIP covers, such as: weekly travel to various cities for testing/specialists' appointments in numerous hospitals which does not cover parking, meals or overnight stays in hotels. Bruce has been unable to work since 2015 due to the complications of this disease and his income is 60% of his previous income causing further financial hardship. We often hear about the importance of organ donation. We seldom hear about the costs associated for the recipient awaiting the transplant. Please donate whatever you can to help make sure that Bruce is able to see his daughter grow up. Since the last update about Bruce’s health challenges we have some really good news to share. On January 1, 2019 he received the call we had been waiting for. He was at the top of the transplant list after a hospitalization in December when his MELD score was 28 & his kidneys were shutting down. They had a liver for transplant. We drove to University Hospital in London and they prepped him for surgery. Unfortunately, the liver was not viable due to Hepatitis C that was not treated and the donor had cirrhosis. This is called a “dry run” and often happens. 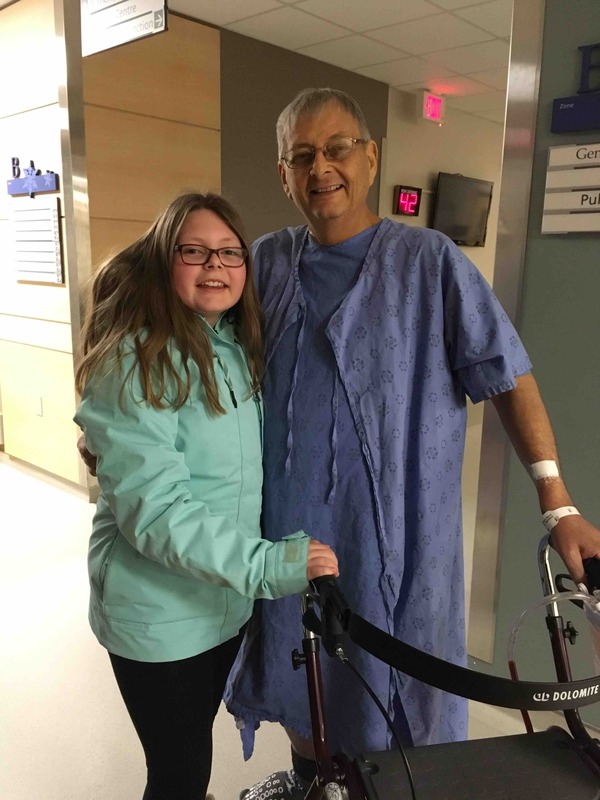 Although disappointing, the next call came on January 10, 2019 & Bruce received his life saving transplant on January 11, 2019. The donor was under 40 with critical life threatening injuries and thanks to their family’s generosity, Bruce has a second chance at life. His motivation has always been to walk his daughter down the aisle. He has worked hard, faced the challenges head on & the journey is far from over. The Dr’s describe it best as a roller coaster & they are not kidding. Now we are discovering the costs of being a transplant recipient. Anti-rejection drugs that cost almost $1600 a month & only generic drugs are covered not brand name drugs. However there can be no substitutions when it’s life or death. We are travelling to London 3 times a week as part of the post transplant requirements of blood work, Physiotherapy, transplant clinic meetings & reviews of medications. 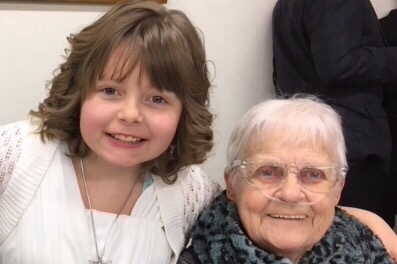 We can’t say enough about the miracles that occur daily at the Transplant Centre. Organ donation is represented by the colour green . Needless to say we are huge advocates and will share more details to share soon. Bruce’s expenses are greater than his income. 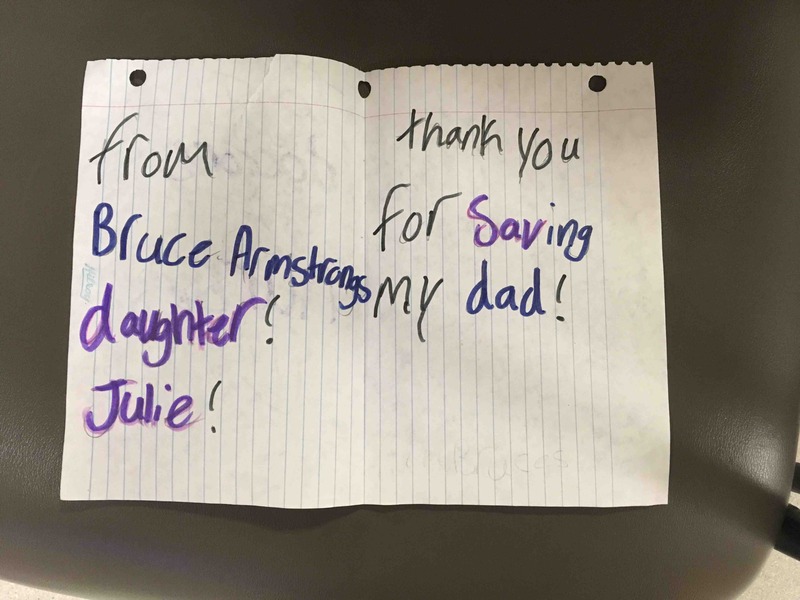 But let there be no doubt that this picture shows how relieved Jules is that her Daddy has a second chance & the thank you note she wrote to the Dr’s & Nurses that saved her Dad’s life. Thank you so much for your generous contributions to support my brother Bruce. Our Mum passed away on Saturday June 23rd knowing that people were honouring her wishes to assist her son. Mum didn’t want the goal to be unrealistic but the reality is people want to make a difference. I raised the goal to $10,000 and hope to exceed that goal with your assistance.